Faisalabad, formerly known as Lyallpur, is the third-most-populous city in Pakistan, and the second-largest in the eastern province of Punjab. Historically one of the first planned cities within British India, it has long since developed into a cosmopolitan metropolis. Faisalabad was restructured into city district status; a devolution promulgated by the 2001 local government ordinance (LGO). The total area of Faisalabad District is 5,856 km2 (2,261 sq mi) while the area controlled by the Faisalabad Development Authority (FDA) is 1,280 km2 (490 sq mi). Faisalabad has grown to become a major industrial and distribution centre because of its central location in the region and connecting roads, rails, and air transportation. It has been referred to as the "Manchester of Pakistan". Faisalabad contributes over 20 percent of Punjab's GDP, and has an average annual GDP of $20.5 billion. Agriculture and industry remain its hallmark. Farrukh Fateh Ali Khan was a player of the harmonium in Qawwali and also was a member of a well-known family of Qawwali musicians. He was the younger brother of Nusrat Fateh Ali Khan, the son of Fateh Ali Khan, the nephew of Mubarak Ali Khan, and the father of Rahat Fateh Ali Khan. Paap is a 2003 Indian crime thriller film, directed by Pooja Bhatt in her directorial debut, and features John Abraham, Udita Goswami, Gulshan Grover and Mohan Agashe. Though the film did not fare well at the box office, it received considerable critical acclaim, especially for its cinematography, direction and Mahesh Bhatt's Indianised adaptation of Peter Weir's 1985 English film Witness. The film is also remembered for its soundtrack, which featured numerous Pakistani artists, and also marked the Bollywood debut of singer Rahat Fateh Ali Khan with Mann Ki Lagan, thus setting a trend of Pakistani singers in Bollywood. Rahat has appeared in four seasons of the Pakistani musical show Coke Studio . In 2018 daughter of Nusrat Fateh Ali Khan said she intended to take legal action against copyright infringement of singers who sing her father's songs. To this Rahat responded saying he was the adopted successor of Nus rat and doesn't need anyone's permission to sing his songs  . In January 2019, Khan was accused of smuggling foreign currency and summonned by the Enforcement directorate of Government of India  . Fateh Ali Khan was a classical singer and a Qawwali musician in the 1940s and 1950s. He was born in Jalandhar, Punjab, British India in 1901. 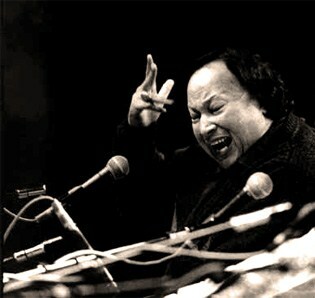 Fateh Ali Khan was the father of Pakistani Qawwali musicians, Nusrat Fateh Ali Khan and Farrukh Fateh Ali Khan. Their family has an unbroken tradition of Qawwali, linked closely to the Sufi Chishti Order for over 600 years. The Rizwan-Muazzam Qawwali Group is a Pakistani Qawwali group, headed by Nusrat Fateh Ali Khan's nephews, Rizwan and Muazzam. Filmi qawwali is a form of qawwali music found in the Lollywood, Tollywood, and Bollywood film industries. Shahid Ali Khan is a Canada based singer in the Qawwali genre, a musical tradition that dates back over 700 years. Jawad Ahmad is a Pakistani pop singer and musician. He is known for his song "Main Tenu Samjhawan Ki" sung by Rahat Fateh Ali Khan. This song was recreated by Sharib-Toshi for Indian film Humpty Sharma Ki Dulhania. Coke Studio is a Pakistani television programme and international music franchise which features live studio-recorded music performances by established and emerging artists. It is the longest-running annual television music show in Pakistan since 2008. Coke Studio combines myriad musical influences, from traditional classical, folk, Sufi, qawwali, ghazal and bhangra music to contemporary hip hop, rock and pop music. Chhaap Tilak Sab Chheeni, is a poem composed by Amir Khusro, a 14th-century Sufi mystic, in the Braj Basha language. Due to the resonance of its melody and mystical lyrics, it is frequently heard in Qawwali concerts across South Asia. The poem has a romantic expression, however, it is a devotional verse penned by Amir Khusro in respect of his spiritual mentor, Hazrat Nizamuddin Auliya as seen in verse below 'I give my whole life to you Oh, Nizam, You've made me your bride, by just a glance'. Most of Nusrat Fateh Ali Khan's early music was recorded with Rehmat Gramophone House later turned RGH Label. Throughout the ’70s and early ’80s Nusrat Fateh Ali Khan released hundreds of cassettes, most of them containing one or two lengthy songs. Chris Nickson, of Global Rhythm, argues that trying to make order of Khan's entire discography would be a nightmare. "Afrin Afrin" is a ghazal song written by Javed Akhtar and composed by Nusrat Fateh Ali Khan. "Mere Rashke Qamar" is a ghazal-qawwali written by Urdu poet Fana Buland Shehri and composed by Nusrat Fateh Ali Khan. It was first performed in 1988 by Khan, and popularized by him and his nephew Rahat Fateh Ali Khan several times in different concerts. "Sochta Hoon" is a ghazal-qawwali written and performed by Nusrat Fateh Ali Khan, originally in UK 1985 Tour on 28 February at Allah Ditta Centre Birmingham. It had been popularized by him and his nephew Rahat Fateh Ali Khan several times in different concerts. 1 2 Rahat Fateh Ali Khan. #CokeStudio7. Retrieved 20 November 2017. 1 2 "Rahat Fateh Ali Khan Information". Answers.com. Retrieved 4 August 2010. ↑ Pallavi Jassi (20 April 2008). "Sufi sublime". The Indian Express . Archived from the original on 3 October 2012. ↑ al., Sarina Singh ... et (2008). Pakistan & the Karakoram Highway (7th ed.). Footscray, Vic. : Lonely Planet. ISBN 9781741045420. ↑ "Rahat Fateh Ali Khan smashes BO sales at Wembly Stadium". Archived from the original on 27 September 2013. Retrieved 3 August 2012. ↑ "Rahat Fateh Ali Khan". cokestudio.com.pk. Retrieved 1 November 2015. ↑ "Rahat Fateh Ali Khan's Zaroori Tha reaches 100 mn club". Radio and Music. 7 July 2017. Retrieved 8 November 2017. ↑ "Rahat Fateh Ali Khan's 'Zaroori Tha' music video crosses 200 million". Radio and Music. 25 May 2017. Retrieved 8 November 2017. ↑ "James Horner, Rahat Nusrat Fateh Ali Khan* – The Four Feathers" . Retrieved 4 August 2010. ↑ "Annu Kapoor host Junoon Kuchh Kar Dikhaane Ka". 2 May 2008. Archived from the original on 12 July 2012. Retrieved 21 February 2011. ↑ "Ustaad Fateh Ali Khan to perform at the IIFA Magic of the Movies & Technical Awards". IIFA. Retrieved 1 November 2015. ↑ "Rahat Fateh Ali Khan to perform at Nobel Peace Prize Award ceremony". Pakistan Today. 22 November 2014. Retrieved 15 December 2014. ↑ "Rahat to sing 'Aao Parhao' anthem at Nobel Peace Prize Concert". The Express Tribune. 7 December 2014. Retrieved 15 December 2014. ↑ "USTAD RAHAT FATEH ALI KHAN – 2014 Nobel Peace Prize Concert Artist". Nobel Peace Prize Concert. Archived from the original on 16 May 2015. Retrieved 1 November 2015. ↑ "'Afreen Afreen' becomes first Pakistani song to cross 200 million views". The Express Tribune. 2018-10-08. Retrieved 2018-12-11. ↑ Staff, Images (2016-08-06). "Amjad Sabri, Rahat Fateh, Abida Parveen kick-start Cokestudio 9 with an emotional tribute" . Retrieved 2016-08-07. ↑ "Singer Rahat Fateh Ali Khan on drive to constantly evolve sound" . Retrieved 2016-08-07. ↑ "MTV Unplugged Season 5 Episode 6 (All Songs) - Rahat Fateh Ali Khan". MTV Unplugged (India). 12 February 2017. Retrieved 5 April 2017– via YouTube. ↑ "Rahat Fateh Ali Khan: Don't need permission to sing Nusrat Fateh Ali Khan's Qawwalis". The Indian Express. 2018-06-04. Retrieved 2019-03-12. ↑ "Pakistani Singer Rahat Fateh Ali Khan Accused of Smuggling Foreign Currency, ED Issues Notice". News18. Retrieved 2019-02-26. ↑ "LSA 2018 entertainment nominations are out now". DAWN Images. 13 January 2018. Retrieved 13 January 2018. ↑ "BBC – Asian Network – BBC Asian Network AMA 2010 – Winners". BBC . Retrieved 24 August 2010. ↑ "Winners - Mirchi Music Awards 2010". RadioMirchi.com. Retrieved 28 December 2017. ↑ "Nominations - Mirchi Music Award 2010". RadioMirchi.com. 30 January 2011. Retrieved 30 September 2018. ↑ "Winners - Mirchi Music Awards 2014". RadioMirchi.com. Retrieved 15 April 2018. ↑ "Nominations - Mirchi Music Awards 2016". RadioMirchi.com. Retrieved 24 March 2018. ↑ "Nominations - Mirchi Music Awards 2017". RadioMirchi.com. Retrieved 23 April 2018. ↑ "TOF Awards Winners 2012". TonguesOnFire.com. Retrieved 28 December 2017. ↑ "International Pakistan Prestige Awards Nominations Revealed!". Brandsynario. 11 September 2017. Retrieved 18 September 2017.